During one of the launch missions of the day, one boat ran aground on an uncharted rock. Immediately, they radioed in and announced that all were safe and they were attempting to back off the rock. Another launch in the vicinity radioed in that they were available to help if needed. Safety is always a priority! The launch was able to get past the rock safely and came back to the ship to be checked out. After the boat was picked up by the gravity davits, the damages were checked out. 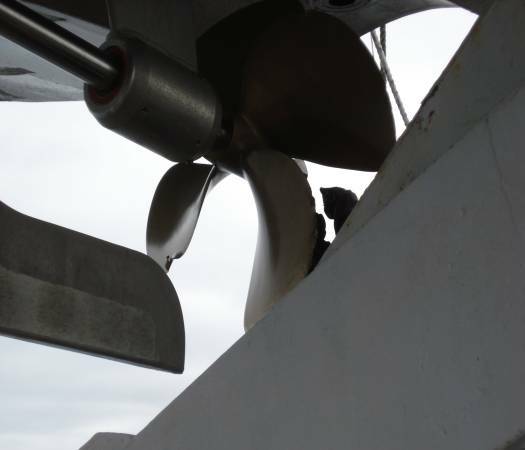 A few bites out of the propeller and some scrapes across the keel were the extent of the damages. I discovered that extra parts such as a propeller are often kept on board for emergencies such as this. The crew switched launches and went back out to continue surveying. After all launches return, there is a daily survey meeting where each HIC (Hydrographer in charge) reports what they accomplished that day and any problems they had with weather, computers, hardware, software or boat issues. Many times, this turns into a great discussion and problem-solving opportunity. This is a true community of scientists communicating and sharing ideas. The group tries to understand a problem so that it is not repeated. Especially after today, I can truly understand the importance of the work this ship and its crew does every day. We saw a tug towing a barge and several fishing boats in the area today. I can only imagine what could happen if they were to run aground. The survey work being done in this area is essential for mariners. Other work done aboard the ship today included taking bottom samples from the seafloor as we moved to another anchorage. This task required communication from the bridge to the fantail (back of the boat) and the fantail to the plot room and the plot room to the bridge. For the first shift, I worked in the plot room. I used the Hypack software that shows an electronic navigation chart to tell the bridge where we wanted the next sample to take place. The bridge navigated to that location and gave the fantail permission to sample the seafloor. 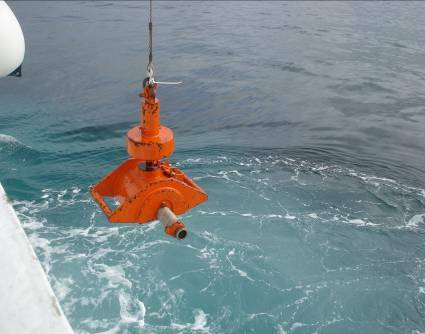 The scientists on the fantail operated a claw-like device to collect the seafloor samples. As they lowered the claw, they radioed to the plot room to tell us how far down it was in 25 m increments. When it reached bottom, I marked that spot on the computer. Then, the fantail radioed as the claw came back up to the surface and finally, what was in the sample. The scientists on the fantail used a chart to identify the size and type of particles found. I made notes as to what was found in the sample on the electronic navigation chart. My partner used Caris Notebook to enter the attributes of the seafloor surface. Then, it was my job to show the bridge, via the electronic navigation chart, where the next target was located. 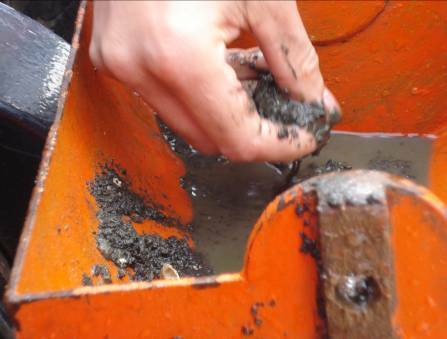 Most of the seafloor we sampled was identified as green, sticky, mud. However, one sample held worms and another held some fine gravel and some broken shells. My next shift was down on the fantail, collecting the samples. This was a great time to dig in the mud! My final shift was back in the plot room logging in the samples. 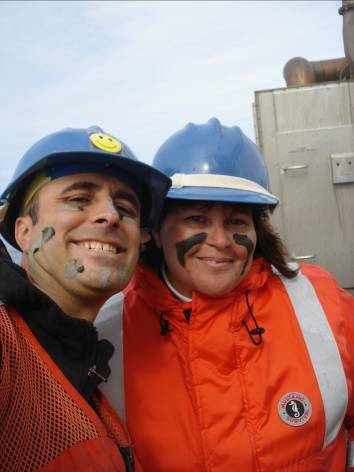 I was initiated into the bottom sample crew with a swath of mud smeared on my face. Later, I realized what a great sea mud mask I could have and wished I’d kept a bucket full of that mud! As we completed our transit to our next anchorage, I spent some time on the bridge. As the conning officer called out instructions, the helmsman and the EOT (Engine Order Telegraph) officer repeated the instruction and ended with “Aye.” I asked if they really had to say “Aye” and ENS Reed explained to me that “Aye” is a confirmation that they have understood the direction given. For example, If the direction was engines full ahead, and you did not say “Aye,” it would mean that the engines were already at full ahead. Another interesting thing I found on the bridge was the words “left” and “right” on plaques attached beside the front windows on the bridge. I thought for sure that these incredibly smart mariners would know their right from their left without a visual reminder. Again, I was told that it has to do with safety and communication. Think about the times you were driving and you told someone to take a right and they went left by accident. On the ship, the order is given to go right and the helmsman looks at the plaque and turns correctly. This is crucial for stressful situations such as a whale crossing your path or narrow passages etc. The EOT (Engine Order telegraph) term dates back to when a pilot wanting to change speed would “ring” the telegraph on the bridge, moving the handle to a different position on the dial. This would ring a bell in the engine room and move their pointer to the position on the dial selected by the bridge. The engineers would move their handle to the same position to signal their acknowledgment of the order, and adjust the engine speed accordingly. This term is still used today even though the bridge can control the engines from their control panel. The same is true of the phrase, “steam ahead.” Even though few modern ships are steam powered, it is a phrase that has come into common usage. Hydrographer in Charge, Ian Colvert, and my “initiation” mud mask! 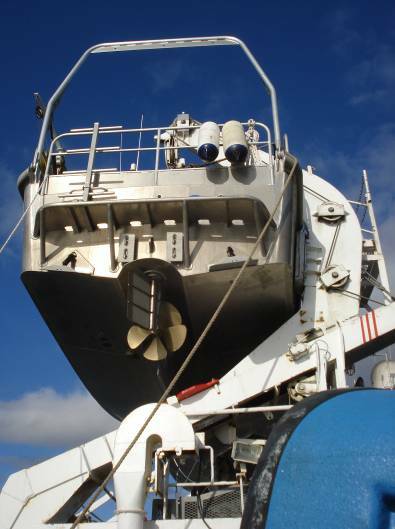 This entry was posted in 2009, Mary Patterson, NOAA Teacher at Sea and tagged Alaska, collecting seafloor samples, data processing, Hydrographic survey, multibeam sonar, noaa ship rainier, propeller. Bookmark the permalink.